If you’re looking for more information on the Slingbox – try our Slingbox Information page. Check downloads.slingmedia.com/page/uk for Slingbox software and firmware updates. Software updates from the UK Slingbox site normally include firmware updates, but you can also update firmware from the Sling Player (Slingbox menu > Directory > Edit > Configuration tab). If you know of a newer version, please let us know. PC: Windows XP, Windows Vista and Windows 2000. Mac: A version for Mac OS X 10.3.9 or later, is available. There’s no subscription or usage fee for using the Slingbox hardware or service. You will need Internet access to be able to connect to your Slingbox remotely over the Internet. Again, normal Internet fees from your Internet Provider will apply. If connecting to a Slingbox in the UK, the household must have a valid UK Television Licence. Slingbox on a Pocket PC There’s a mobile player for Slingbox, that’s been released to run on the Windows Pocket PC 2003 / Windows Mobile v5.0 platform, for use by those with Microsoft-powered PDAs. This is available for download from the Slingbox site (on the US software download page, not the UK download page). It’s a 30 day evaluation version, and it costs $29 to register after the 30 day trial. We installed the US version, and it seems to work perfectly well with our UK PAL Slingbox, allowing us to watch and control our setup – pictured to the right, is us setting Sky+ via the onscreen remote control over a wi-fi connection on the Internet. Great for setting shows when out and about. 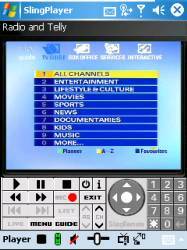 Tests were done in January 2007 using SlingPlayer Mobile v1.1.0.95 running on an o2 XDA Orbit Pocket PC with a UK Slingbox running firmware v1.0.31. If you’re looking for a Windows Mobile device with an Internet connection In the UK, you might want to consider a device like one of the T-Mobile MDA range, on the T-Mobile Web ‘ n’ Walk tariff, which offers some of the best data transfer deals at the moment. See t-mobile.co.uk. Slingbox for iPhone If you have a Slingbox, you can now watch the output of your Slingbox on an Apple iPhone. You can stream video content via the Sling Player iphone application. Mobile phone network We’ve been asked if it’s possible to watch TV via Slingbox over the mobile phone network, either using GPRS or 3G Internet connection. From our tests, the answer is ‘technically, yes’. We’ve been able to connect to a Slingbox using a Qtek s200 Windows Mobile device, using o2’s Mobile Web GPRS service, and a connection is made successfully – unfortunately, the bandwidth of GPRS isn’t good enough to allow streaming video to work smoothly, so although you can watch TV over GPRS, it’s very choppy. It’s certainly good enough to allow setting of Sky+ over GPRS though, which is great. If you’re looking at using a Slingbox over a mobile phone network, you need something with a higher bandwidth than GPRS, and in the UK, we’re talking about the 3G network. 3G offers data transfer at a much faster rate (speeds of up to 384kbps), which supports streaming video over the mobile network. The downside, is that costs for using 3G to view streaming video aren’t cheap, and you should check with your network operator to determine the price you’ll be paying. With GPRS or 3G, you normally pay by the megabyte downloaded, or a fixed monthly usage fee. Slingbox on a Symbian Mobile In late 2006, a version of the Sling Player for Symbian smartphones was launched. At the time of writing, the Symbian version is available for OS v9.1, specifically for the Nokia E65 handset. Check out UK operator 3’s X Series for details of a package offering Slingbox on a high-speed mobile network and a Symbian phone. Connecting with wi-fi The Slingbox is supplied with an Ethernet port for making a connection to the Internet. But what if you want to go wi-fi? You’ll need to get an ethernet-to-wifi adapter. 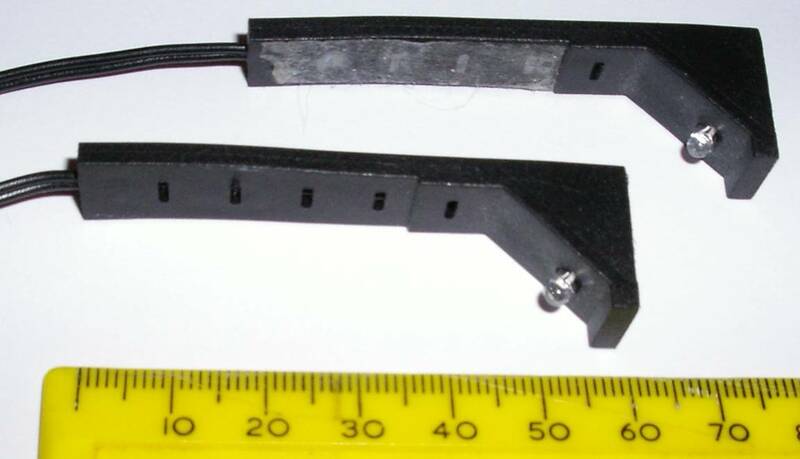 These are commonly referred to as “Game Adapters”, as they’re most commonly used to connect boxes like the Microsoft X-box to a wireless network. To get set up, we first had to connect the Ethernet Adapter to our router, and use the supplied software to set up the Ethernet adapter (setting the IP and WEP encryption). Once done, we then connected the Ethernet Adapter to the Slingbox by ethernet cable, and ran the Slingbox configuration software again from our PC. The software picked up the Slingbox over the wi-fi network (via the router), and let us view TV wirelessly. The slightly more challenging bit, was to get this setup to be accessible outside of our local network – for this, we had to open up ‘port forwarding’ via our router – it’s important to note that you forward to the Slingbox IP and port, and not the IP of the Ethernet Adapter. Network cabling If you want to connect your Slingbox to your Broadband router, you need to use the Slingbox Ethernet connector… But what if your Slingbox is in a different room to the router? You could use wifi, or you could consider using a HomePlug / Powerline adapter. These use your existing in-house electrical wiring – just plug your Slingbox into a HomePlug, and plug the HomePlug into the mains. Another HomePlug is needed near the router – sending the network traffic via the mains socket, and connecting over the mains. When trying to connect from work, some users have reported that they can’t get a connection – with messages such as “Make sure the Slingbox you are watching is on, set up for remote viewing, and not blocked by firewall/NAT settings 0x8007274C”. One common fix appears to be to change the port number from the default value of 5001 (often blocked firm’s IT departments), to port 443 (the port used for secure web pages). This seems to overcome the problem for a lot of users. Your Broadband router may be preventing the incoming request for connection from coming through. Your router has a firewall preventing unauthorised access. You may need to set up Port Forwarding to allow the incoming connection to come through. Need help with getting a Slingbox through a BT Home Hub firewall, see the FileSaveAs Home Hub Port Forwarding section. Slingbox and Sky Satellite TV Slingbox works very well with Sky Digital, the UK’s satellite TV provider – the output of your Sky or Sky+ box can be connected to a Slingbox, and can then be sent over the Internet. Typically, you’ll need to take a feed from one of the Sky box’s RF (aerial) outputs and connect to the aerial input on the Slingbox. Make sure the Sky box RF modulator is on. We’ve been asked if it’s possible to use Slingbox so that someone at home in the UK can watch one channel using a Sky / Sky+ box, while someone else remotely accesses a different Sky channel. The answer is no, as the Sky boxes can only output one TV channel at a time – and so both local and remote viewers will only be able to watch the same channel at the same time. If there is a requirement for you to be able to watch one Sky channel remotely, while someone locally watches a different Sky channel, you will need two Sky digiboxes – you could purchase Sky Multi-room – which gives you an extra Sky box. If it’s not practical to get two Sky boxes, you may find that the channel you’re trying to watch remotely, is available on Freeview. Note that the UK version of the Slingbox has a built-in Freeview receiver, that can get over 40 free-to-view TV channels via a standard home TV aerial. You can watch these Freeview channels remotely over the Internet without disrupting the home-end’s Sky viewing. To get the Freeview channels, you need to be in an area of Freeview coverage, and to connect a TV aerial to the Slingbox. Getting Freeview on a Slingbox is detailed elsewhere on this page. Slingbox and Sky+ Slingbox can be used to control Sky+ boxes remotely perfectly – watching recording, setting up recordings and watching TV. Slingbox and HD We’ve been asked if there are any limitations if upgrading to Sky HD (high definition), and using Slingbox. As far as we understand it – a Sky HD box still has outputs that can be fed into a Slingbox. The Slingbox doesn’t support a high-definition input, so streaming of HD video over the Internet with a Slingbox isn’t supported, but non-HD content can be streamed. As HD only makes up a very tiny percentage of Sky’s output at the moment, this is unlikely to be a limitation at this stage. Go to Player > Slingplayer options, and play around with the settings. Make sure ‘High Quality (LAN) is disabled, and enable ‘Enable SlingStream smoothing‘. You can also try reducing the encoding rates. The application help can help. The answer is yes – Slingbox functions well over a network (connected via the same router). As data speeds are better than over Broadband, you get a more stable picture. UK TV Licence We’ve been asked if you need a UK TV licence when using a Slingbox to watch UK TV content. Under the Communications Act 2003, you need a valid TV licence to receive or record TV programmes. The UK Slingbox comes into this category, as it has a UK TV tuner on board, so is capable of receiving TV programmes. There’s an interesting article on the What Satellite and Digital TV website that reports that, as the Slingbox isn’t battery powered, to watch TV via a Slingbox, you need a licence for the new location, as the TV licence covers a location, not a person. If you have any doubt about licensing and Slingbox, play safe and check at the TV Licensing site. The answer is yes, you can change channels of external equipment. You have an on-screen remote control that sends remote commands to your Slingbox. The Slingbox comes with two infrared transmitters that you position in line-of-sight of the infrared senor on your set-top box, so when you press on the virtual remote control the command is send over the Internet to Slingbox, and then via IR to the equipment you’re controlling. Other video sources We’ve been asked if the Slingbox can be used to transmit other sources, such as the output from a games machine like the Nintendo Wii, over the Internet. The answer is, as long as the video source is capable of outputting video (see spec), yes – the video and audio can be sent. The downside is that you will almost certainly not be able to control something like a games console over the connection, as the Slingbox handles remote control by sending commands using infrared. Quality of streaming video We’re quite often asked about the quality of streaming video over Slingbox, or whether someone overseas on a slow connection will be able to get a high enough throughput to make Slingbox workable. The only real way of getting a feel for the quality and speed of Slingbox video is to see how your PC or Mac handles streaming video. If it can’t cope with streaming video, from a site like BBC News, then Slingbox will be a problem too. The best way to assess Slingbox is to access a real Slingbox feed. As far as we can tell, there isn’t a test feed of Slingbox video available from the UK, but, try asking in our forum – it may be possible for one of the forum regulars to let you have access to their Slingbox briefly for a trial. 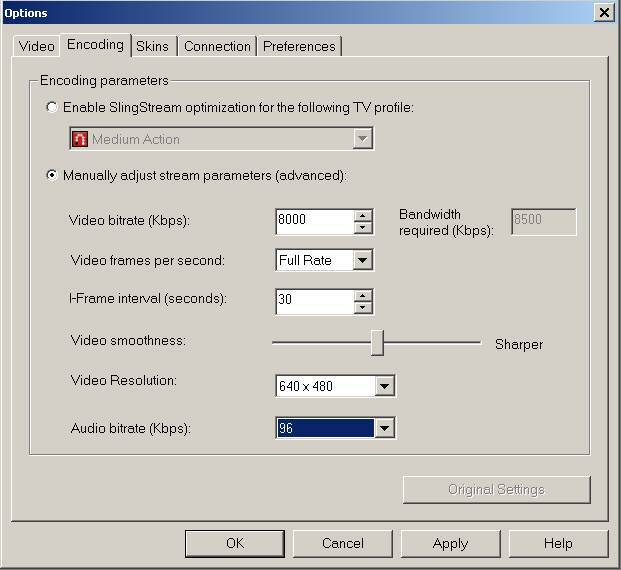 If you’re interested in the technical properties of the Slingbox video stream, you might find our screenshot of the Encoding options screen of interest – all values set to maximum, to highlight the max range. Speed and bandwidth We’ve been asked a few questions about data transfer rates, picture quality, and how watching video over Internet with a Slingbox affects broadband accounts that have download usage restrictions (e.g. a 5 Gig a month download usage cap). To help explain this, we need to explain the factors that affect video quality using Slingbox – A bit technical, but bear with us. The key factor is the number of bits that can be sent from Slingbox-to-Player. This is measured in kilobits per second, and the playback video quality and screen size decide how many kilobits per second are needed to get a watchable picture on your PC. It’s important to understand that the upload speed from the Slingbox to the Internet, and the download speed of the Internet connection at the Player end, both affect the overall transfer rate… and it’s the lowest number of the two speed values that’s the important one – for example if you can only upload at 500kbps, an 8meg download at the other end won’t help you get more than 500kbps of data downloaded. To get an acceptable picture, the Player needs to be getting between 250-750kilobits per second downloaded over the ‘net from a Slingbox. Regarding broadband accounts with usage restrictions, again, this depends on how much data you’re able to download. Assuming a constant video download rate of 500kbps, this would equate to 0.225 Gigabytes of data per hour – In other words, just under 4 and a half hours of video equals 1 gigabyte of download. The maths: 500kbits/sec x 3600 seconds an hour / 8 (to get from megabits to megabytes) – Megabytes per hour. Remember it’s normally your download that’s capped, not your upload – so the place that you watch the Slingbox output is where the download limit could bite you, not the place where you upload. If you’re worried about your cap, consider shifting Broadband providers, perhaps to BT Total Broadband Option 3, or the top TalkTalk package – both offer unlimited downloads. It’s possible to set the Sling Player to reduce the data rate, so if you’re prepared to live with a reduction of quality (less refreshes and a smaller playback window), then you can drop the data transfer rate, reducing the amount of megabytes downloaded when watching your Slingbox. Dialup? We’ve also been asked if it’s possible to watch Slingbox over a dial-up connection – As we’ve established above, a watchable picture needs at least 250-500kbps, and a dialup connection is only 56kbps. By reducing the playback screen size and dropping the quality to the lowest setting, you may just be able to get Slingbox to work, but you won’t be impressed by the results. Multiple PCs Q. Can I watch two channels at the same time over a Slingbox? Q. Can two people watch the output of Slingbox at the same time? Q. Can I have the Slingbox software on two different PCs and access the same Slingbox? There’s no restrictions on how many PCs or Macs the Sling Player can be installed onto, so you could have a PC in the US and in, say, Spain, both able to access a Slingbox in the UK. As per the above question – note that two Players can’t access the same Slingbox at the same time. Slingbox on a TV not a PC Q. Can the Slingbox work on a television screen (not a PC screen) anywhere in the world? The Slingbox allows you to view TV via the Internet on a PC (or supported mobile phone), and not a TV set. This is because you need the Sling Player software to watch the output. However, in 2008, a box called the SlingCatcher was released in the UK. This allows playback of a Slingbox on a TV, not a PC. As an alternative, it is possible to connect a PC or laptop’s output to a TV. Some TVs (such as the Sony KDL32-S2010) have a “PC input” that can take a feed from a PC or laptop, otherwise there are several PC-to-TV converters out there, such as the Kworld PC to TV Converter USB. Take a look at Maplin Electronics for various converters and connectors. Sony’s LocationFree: This box offers a similar service to Slingbox The Location Free box lets you watch live TV, play back recorded programmes and control your digital recorder, all from a PC, laptop or PSP (Sony PlayStation Portable). Big difference between LocationFree and Slingbox, is that LocationFree has built-in wireless technology (wifi), whereas Slingbox requires a wired connection, or a separate wi-fi adapter. Note too that the LocationFree is only licensed for use on one desktop computer, and to use from multiple PCs, you’ll need to buy extra software licences – this isn’t an issue for Slingbox. The LocationFree box is more expensive than Slingbox, but a very viable alternative. Available from Play.com and Amazon.co.uk. Orb on a PC – Both Slingbox and LocationFree are hardware solutions – boxes that connect to your TV setup and the Internet. An alternative, and cheaper, option, is Orb. This is a software solution that runs on a PC with a TV card installed/connected. You can use Orb to schedule recordings onto the PC’s hard disk. The Orb software runs in the background on your PC, and from another PC, you can connect in, watch live TV from the remoter machine’s web browser, and even play audio and video from your PC remotely, and it requires the following: A PC with an Internet connection. To use Orb, you must have a suitable TV card, be prepared to leave your PC on, running the Orb software and connected to the Internet. You also need to connect a TV aerial (for analogue TV or Freeview) into the input of the PC TV card. For more, see FrequencyCast’s TV Control page. For the UK end, get a Freeview PVR (or Sky+) and connect this to your Slingbox. You can then use the Sling Player software to access the PVR or Sky+ box, either to set a show to be recorded on the PVR, or to stream a recorded TV programme. One other option is to make use of the Sling Catcher product, which will output a Slingbox feed to a TV instead of a PC – presumably, if it’s able to output to a TV, it’ll be possible to connect it to a VCR or DVD recorder. Anyone out there have anything to add on this topic? Let us know. UK Slingbox outside the UK We’ve been asked a couple of times if it’s possible to use a UK Slingbox outside of the UK. The UK Slingbox uses 240VAC for power, comes with a PAL TV tuner, and is optimised for the UK television frequency range. If the country you’re planning to use a Slingbox supports these specifications, then it should work. We’re not experts in overseas TV systems, so you may find it best to ask about suitability in a specific country in the Slingbox forum. More on using a Freeview receiver abroad in our Freeview Box Overseas FAQ. Infrared Remote eyes We’ve been asked for more details on how the Slingbox is able to control devices. The Slingbox’s built-in Freeview tuner can be controlled by the Sling Player software – but what about other devices that you want to control remotely? Well, the Slingbox comes with two infrared eyes. These plug in to the back of the Slingbox and need to be lined up in front of the infrared window on the device you want to control. There are two eyes, to allow you to control two devices, or to improve infrared signal to one device. They can be stuck in place with supplied sticky pads. Click on the picture to the right to see a close-up of the Slingbox infrared extenders. Reset the Slingbox To reset the Slingbox back to factory defaults, hold down the Reset button for five seconds. The lights on the front will flash left-to-right quickly, and then slowly, and the restart takes around 30 seconds. Power The Slingbox is mains-powered, and is supplied with a mains transformer. One recurring question asked by visitors to the site is: “Does the Slingbox have to be plugged in to work?” As with all electrical equipment, the Slingbox requires power to work. If you unplug the Slingbox from the mains supply, it won’t work. Note that the router (that connects to your broadband) will also require power and won’t work without a power supply. The supplied mains adapter with the UK Slingbox is rated as follows: 100-2540VAC, 50/60Hz, 0.45A. Output is 6V at 2.45A. Freeview Questions Some questions we’ve been asked about using a UK Slingbox with Freeview. Q. I have a Freeview box connected to my TV. If I connect Slingbox, could I watch one Freeview channel while there is a different Freeview channel on my TV? Would I need another aerial connection? A. As the Slingbox has a built-in Freeview tuner, it can be used to transmit Freeview without interrupting anything you’re viewing on your TV. All you need to do is connect an aerial feed to the Slingbox. You won’t need another aerial – you should be able to use the existing aerial, using an aerial splitter. Q. I already have a Freeview box. How will this work? A. The Slingbox has a built-in Freeview tuner, so it’s easiest to use the built-in one (as there’s less cabling to connect). All you need to do, is connect a TV aerial to the Slingbox aerial input. If for some reason, you’d prefer to use your own Freeview box, then this can be connected too. A. As with any digital TV receiver, you need a good enough signal to get Freeview channels. See our Reception page for help on this. A. We agree, it’s odd, but the built-in Freeview receiver inside the Slingbox can’t tune in to the radio stations broadcast over Freeview. No idea why not. One option is to connect a Freeview , Virgin Media or satellite TV box (one that’s capable of getting radio) to the Slingbox, then tune the set-top box into the station you want to listen to, and listen through the Slingbox. Alternatively, see some other ideas on our Internet Radio page. Q. Will the UK Freeview receiver in the Slingbox work in other countries? Q. If I’m accessing Slingbox remotely and want to change channels, will this affect what’s being viewed at the ‘home’ end? A. This depends on how you’ve set up the system at the ‘home’ end – If the remote person is using the Freeview receiver that’s built-in to the UK version of Slingbox, then changing the Freeview channels won’t disturb what’s being watched on the home TV – as the Slingbox Freeview tuner is just feeding the remote end. If the remote viewer is watching, say, the output from a Sky box remotely, then as a Sky box can only output one feed at a time, changing the channel remotely will affect the home viewer’s use of that equipment. See our Slingbox Sky answer for more on Slingbox and Sky. Q. Is the Slingbox player available for purchase – is it a separate piece of equipment or is it anyone’s laptop or computer screen? A. The Slingbox is a piece of hardware that’s available for purchase – this plugs into your TV setup and to the Internet. The Slingbox Player is a bit of software that’s available for download from www.slingmedia.com – the software has to be installed on the PC where you want to watch TV. Q. Do I need a static IP address for Slingbox? My home IP changes whenever I connect, so my IP address changes. A. No, you don’t need a static IP address (although you can use one if you want). Each Slingbox has a “finder id”, which is a unique number – boxes can be found when connected to the Internet regardless of the home machine’s IP address. Q. Is the Slingbox available in USA or Mexico? A. Yes, the Slingbox is available in the USA and Mexico. The US version is designed with connectors for the US, works on US power supplies, uses NTSC (not PAL), and doesn’t support Freeview. Q. Can I use a US Slingbox in the UK? A. The answer appears to be yes, but there are some differences… The UK mains voltage is 240VAC, so you’ll need a power converter to step up from the lower US voltage. You may also need SCART-to-A/V cables for use with UK equipment that has SCART sockets. Remote control codes for UK equipment may not be supported on the US player. The UK uses PAL encoding and the US uses NTSC, so there may be some image/quality issues. The UK model comes with a built-in Freeview receiver (to receive around 40 free digital TV channels) – the US model does not. Q. Can I use Slingbox to relay TV from one room in the house to another? Q. Can I view Slingbox full-screen on my PC? Yes – via the View menu, or by using the shortcut: Alt-Enter. You have the option to watch full-screen, or in a resizable window that you can drag around your PC screen. Q. Do I need a fixed IP address to use the Slingbox? A. No. Slingbox uses something called a Finder ID. The Slingbox transmits this to a central location, and the Sling Player uses the Finder ID to identify the IP address of the Slingbox hardware. Q. My Sky+ box switches off automatically overnight. Can I still use a Slingbox? software program referred to as the Internet TV software. internet connection to be able to watch these movies online. Am overseas picking up sky via sling player. The audio/video is great however I can’t turn over the channels of the skybox via the sling player remote controls on my iPhone or iPad. Any suggestions please? I have had similar problems ( my picture even freezes) ive even bought a new slingbox but its the same problem. I think the problem is with the sky receiver , im buying a timer to turn off sky receiver and turn it on again so that the sky receiver can reboot itself. Every so often when im abroad.